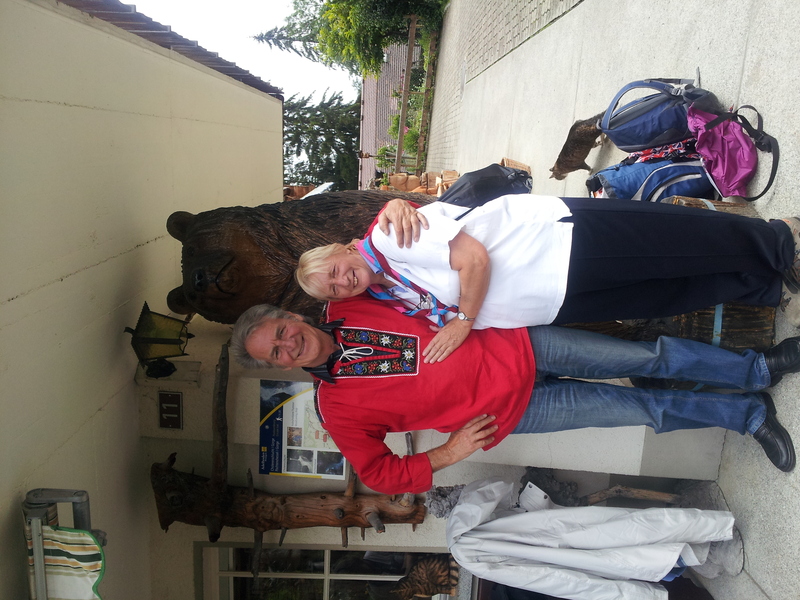 This morning after breakfast we met Eleanor (our lovely VA guide) and walked to the woodcarver which took an hour and a half. It probably would have taken us longer, but we were going at Eleanor superspeed… which was so fast we hardly had breath to sing as we walked. (But don’t worry, we didn’t let the side down as we managed to belt out a showstopping version of an Austrian went yodelling with some great bear impressions). When we got to the woodcarver we saw some amazing statues and felt very proud when our badge joined the others from around the world on the ceiling display. For some reason the leaders went mad buying loads of wooden trefoil badges and having the names of what seemed like everyone they knew branded onto them by the woodcarver! Luckily the woodcarver was very patient, even when Dot sang the whole of Eidelweiss to him which we are sure he must have heard a million times. Meanwhile, we all sloped off to the cafe next door for a drink and a massive wedge of cake. Fully refreshed, we then started to walk to Cholorenschult gorge. We climbed lots of steps which were really high and scary, the waterfall was very fast with very good views. The sun came out whilst we circumvented the valley. The hills felt steeper and steeper but we pushed on as we were determined to get to our ‘mountain top’ at Our Chalet. A cheer went up as we rounded the corner to find that, after two years of planning and fundraising we had finally made it!!!! After the leaders stopped crying, we had a tour of Our Chalet with Anna and Ashton showing the history of the centre. During the tour we got to swap badges left by other visitors and leave our own badge pinned to the board. We also presented our necker to Our Chalet in the hope that it will be added to the others hanging in the WAGGS room and that Somercotes Guides will become part of the history of Our Chalet. Our Chalet is already a part of the history of 1st Somercotes as our Mrs O, cheering us on back in Derbyshire, brought a group of Guides here in 1983… a group which included the mothers of three of the Guides on this trip! We then visited the shop where some of us bought a badge to add to the ever growing pile we are collecting for our camp blankets. We then made our way down the not so secret shortcut back to our current home. P.S. – Apologies to the Lincolnshire ladies next door for accidentally mislaying their knickers….